Atlanta's Philips Arena will be the site of UFC 201 this Saturday, penning a premier bout between defending Welterweight champion Robbie Lawler and Tyron Woodley. The pay-per-view event will look to quickly rid the bad taste left by UFC 200, which saw the pulling of Conor McGregor and anti-doping violations of both Jon Jones and Brock Lesnar, and for fans with interest in attending, UFC 201 tickets on TicketIQ are steadily dropping in the days leading up to the event. As it stands now the average resale price for UFC 201 tickets is now $187.24. That is a 47% dip from its July 13 average of $352.21. The cheapest ticket is now available from $84 in Section 319, down 14% from the $98 get-in price listed nearly two weeks ago. Those prices won't nearly come close to what UFC 200 posted prior to its July 9 date. One day prior to the event, which was officially headlined by Miesha Tate and Amanda Nunes, tickets owned a secondary market average of $1,207.60. That made it the most expensive UFC match TicketIQ has tracked since 2010. 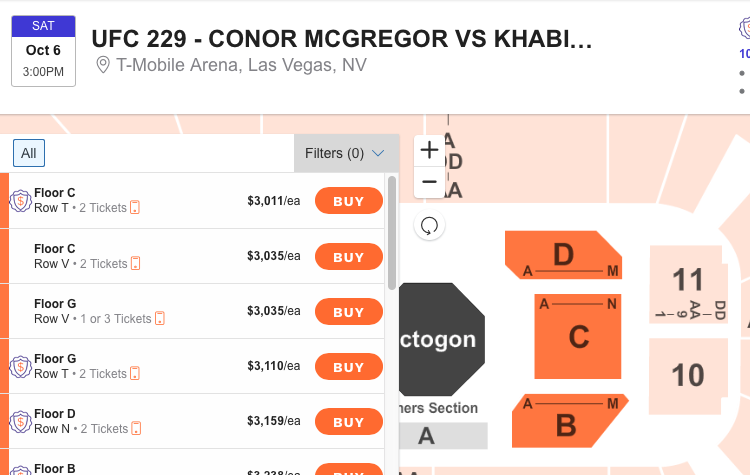 The cheapest ticket to UFC 200 at T-Mobile Arena was a whopping $600. Lawler will enter Philips Arena with a career 27-10-0 record. He has defended his Welterweight title twice before against Rory MacDonald and Carlos Condit, beating MacDonald by TKO and a split decision against Condit. Woodley serves as a formidable opponent, however, and ranks third in official UFC welterweight rankings. He last faced Kelvin Gastelum at UFC 183 in January of 2015, where he gave Gastelum the first defeat of his professional career. The remainder of the main card will feature Rose Namajunas against Karolina Kowalkiewicz in a Women's Strawweight bout, an additional welterweight match between Matt Brown and Jake Ellenberger, a heavyweight match between Francisco Rivera and Erik Perez and Ian McCall vs. Justin Scoggins in a flyweight match.